Dada was born and bred in Johannesburg, South Africa. She began formal training at The Dance Factory at the age of 11. She also attended Johannesburg’s National School of the Arts, from which she graduated at 17. After a year as a trainee at Cape Town’s Jazzart Dance Theatre, she was accepted at the Performing Arts Research and Training Studios in Brussels, where she remained for two years. Returning to South Africa late 2006, she began to create work. 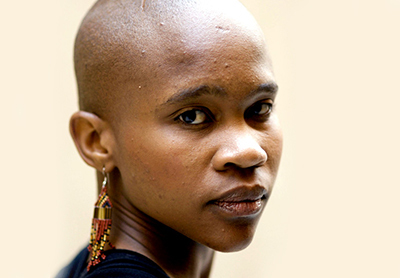 In 2008, she was awarded the prestigious Standard Bank Young Artist Award for Dance. Three commissions from the National Arts Festival resulted in her Romeo and Juliet (2008), Carmen (2009) and Swan Lake (2010). In 2011, she was invited to present a solo work for the Anticodes festival at Le Quartz in Brest, France. The work entitled The Bitter End of Rosemary led to a proposal to tour her works in Europe. So far, Swan Lake has toured extensively throughout France and also to 6 cities in Italy including Rome, throughout Switzerland, to Stockholm, Dusseldorf, Innsbruck, Hamburg, Luxembourg amongst others. Masilo restaged her Carmen to open at the Lyon Biennale in September 2014. This began more extensive touring in Europe, including 5 weeks in Paris. In 2015 she toured both Swan Lake and Carmen. Her works were seen in Norway, Greece, Russia and The Netherlands. In November, Masilo appeared at BAM (New York) and at Yale University with Kentridge’s Refuse the Hour. In 2016, she staged and performed Swan Lake in Ottawa, Montreal, Hannover, Amherst and Pittsburgh, finishing with 6 performances at The Joyce Theater, New York. This was immediately followed with performances at the Perth Festival in Kentridge’s Refuse the Hour. Masilo has a deep love for the classics – from Shakespeare to Tchaikovsky, from Ballet to Flamenco. As a dancer, she has impressed with her `signature speed` and also to imbue her roles with a precocious theatricality. As choreographer, she has been amazingly daring, tackling the `big’ stories and boldly fusing dance techniques ; musically, mixing the original scores with twentieth century composers and performers.